The Asia-Pacific region is home to 40% of natural disasters and 84% of people affected by natural disasters worldwide. Furthermore, the 2016 World Humanitarian Summit highlighted a growing humanitarian funding gap, which reached 40% in 2016, and a geographical imbalance which saw just 0.2% of funding provided directly to national and local NGOs in 2016. With growing challenges posed by the intensity and scale of disasters in Asia, there is a system-wide acknowledgement of the need to place affected populations at the center of humanitarian programming and in-country responders to be better placed to design and implement effective programs, not their international counterparts. For that to happen, however, local NGOs must look for new and innovative ways to increase their efficiency and effectiveness to be capable of becoming the primal responder. ADRRN, a civil society network with 56 member organizations, active in 20 countries throughout Asia, and the HIF, a landmark grant-making fund to support organizations working in countries and regions facing humanitarian challenges, established a strategic partnership in March 2017 to further develop innovation capacity of national and local NGOs in the Asia-Pacific region. This workshop convened in Jakarta from May 30th to June 1st is the first collaborative work of HIF-ADRRN strategic partnership to fulfil the mission with funding support by ECHO. The 8 participant teams, each comprised of 2-3 different organizations, who are selected from 57 applicants through online application process attended the 3days workshop. The workshop was comprised of 3 parts. On the first day, the teams worked in group to create ‘Proposal Canvas’ which is a visual planning tool and template for developing new proposal specifically targeted at HIF seed fund. The Proposal Canvas is composed of 8 elements, and the participants discussed their view within the team to better understand their own project. On the second day, the focus was given to humanitarian innovation which was the core of this workshop, and in the afternoon, each team started to construct their proposal based on the learnings from the earlier sessions. On the final day, each team made a presentation to the panel to gain feedbacks from the perspectives of respective field. Overall satisfaction rate of the workshop was 90%, which well exceeded the expectation level of HIF considering this type of group workshop was convened for the first time in Asia. Although the participants appreciated the workshop in a diverse way, comments included “constructing proposal and making presentation in more structured way helped”, and “opportunity for amazing networking and diverse connections.” For suggestions, “showcasing a few best models,” and “more ‘get to know you’ activity on the first day” were shared. In addition to the learnings on the elements of the Proposal Canvas, humanitarian innovation, and constructing proposal, the organizers found attending the workshop encourages the participants who are addressing the most challenging issues in respective field with minimum support. There is a need for more innovation workshops across the region as well as the follow-up program for the participants so that they are continued to be connected in the innovation network. Canvas, the evaluation score of ‘Resources’ and ‘Challenges/Risks’ increased the most. Considering these 2 elements were scored the lowest before the workshop, it can be inferred that the workshop provided the opportunity to face these issues that tend to be overlooked in their daily operation. 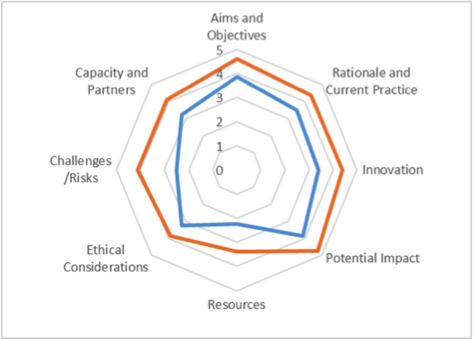 One of the teams commented in the self-evaluation that they were able to understand not only what resource they were missing but also what they have in the team which made them more confident about their ‘Resources.’ Although it is not visible in the radar chart, the score of ‘Aims and Objectives’ increased for relatively new teams of which members recently started to work together, and they appreciated the workshop because they had the opportunity to acknowledge the gap in understanding and expectation toward the project, and discuss to find a common target. Lastly, for ‘Innovation’ element, even though the score improved for most teams, there still might be a room to improve further taking into consideration that few teams articulated their innovation in the final presentation, which can be the focus of the follow-up activities of ADRRN and HIF.